Recently learned that as mayfly nymphs grow, especially March Browns, Cahill’s, and Hex the eyes really get big right before the hatch. A macro shot of a Hex nymph we found in the mud looking for what else is hatching. Based on his eyes, we are not too far away. 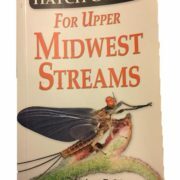 Want to learn more about bugs in the Mid West make sure to pick up Ann Millers Book.